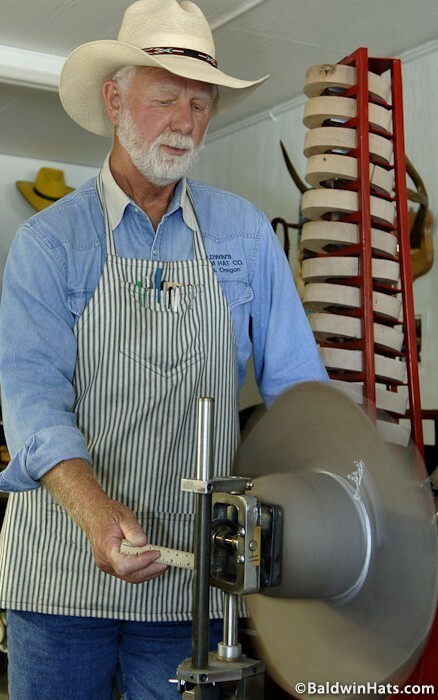 Making Hats – Baldwin's Custom Hat and Boot Co.
Manufacturers make hat blanks from beaver and hare fur. Then hatmakers like Baldwin use the blanks to block, shape and finish each hat. Much of the hat-making equipment that Baldwin uses was manufactured in the 1800s. He has sourced his antique hat-making equipment mainly from hatmakers who are no longer in business. One of the key challenges Baldwin has faced is to bring the equipment up to modern, usable standards. For example, one of his presses was steam-powered and he had to convert it to electricity. Some equipment he has had to have handcrafted, using old drawings and photos as guides. Baldwin using an antique crown iron to, you guessed it, iron the crown, which is part of the shrinking process to fit the hat to the block and remove the wrinkles. photo by Chris Miller. All of Baldwin’s hats are made from fur felt. He sources 100% beaver felt, 50/50 hare and beaver and 100% hare. Baldwin’s hats are guaranteed for their quality and fur content, unlike most premium hat manufacturers who dropped their fur content guarantees years ago. Each hat blank weighs eight ounces which is a normal-bodied hat weight; a six-ounce weight is available, but Baldwin rarely uses these. Beaver felt is also highly resistant to moisture; for the person who spends considerable time in the snow or rain, it is by far the best choice. Baldwin comments that, “In early times the beaver furs that were worn by the Indians were sold for premium prices, as the guard hairs were worn away and the fur had not only the oil from the beaver but human oils as well. Those pelts made premium hats and brought the highest prices in Europe.” He went on to say that people exterminated beavers in Europe, and they could not get enough beaver pelts from the new world to satisfy the demand, almost destroying the beaver population of the new world as well. These days, most of the beaver and hare fur comes from Europe where the animals are farmed.